Dr. Heinz-Ulrich Thimm is Professor of Agricultural Economics and Director of the Centre for Regional Development Research at Justus-Liebig University Giessen, Diezstrasse 15, D-6300 Giessen, Federal Republic of Germany. 3.1 Simsim mechanized farming project. 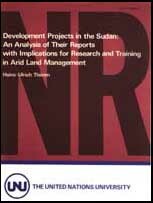 3.5 Nuba mountains agricultural production corporation (NMAPC). 3.6 Gerih el Sarha settlement scheme. 3.7 Agadi state farm, Blue Nile province. 3.8 Mechanized Dura production schemes, Gedaref region.